A chair is a common item of furniture. Furniture is the collective term for the movable objects which support the human body (seating furniture and beds), or provide storage, and hold objects on horizontal surfaces above the ground. Storage furniture (which often makes use of doors, drawers, and shelves) is used to hold or contain smaller objects such as clothes, tools, books, and household goods. Furniture can be a product of artistic design and is considered a form of decorative art. Ordinary furniture may be put to use during a spanking in several ways. A spankee may be required to bend over a chair, bed, table, desk, or bench. A spanker may sit on a chair, bed, or bench. 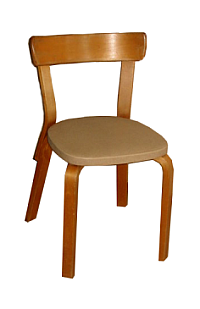 Before or after a spanking, the spankee may be required to sit on a chair or stool as a form of corner time. There also exists specialized spanking furniture such as a spanking bench or spanking horse. Such restrictive devices as the stocks or the pillory might also be considered a form of punishment furniture. This page uses content from Wikipedia. The original article was at Furniture. The list of authors can be seen in the page history. As with Spanking Art, the text of Wikipedia is available under a copyleft license, the Creative Commons Attribution Sharealike license.